Orbital Sciences Corporation announced on Dec. 12, 2011 that Antares™ will be the permanent operational name for the medium-class launch vehicle created by its research and development program formerly known as Taurus II. This artist's impression shows the rocket lifting off. A new rocket being built to launch a private robotic spaceship on cargo trips to the International Space Station has a new name: Antares. The Virginia-based company Orbital Sciences picked Antares as the new moniker for its Taurus 2 rocket, a new medium-class booster initially slated to launch the firm's unmanned Cygnus spacecraft on space station cargo flights for NASA. The first test launch is scheduled for February. Orbital officials also hope the Antares rocket can serve other civilian and military customers as well. "We are transitioning to the Antares identity primarily because a launch vehicle of this scale and significance deserves its own name, just like Orbital's Pegasus, Taurus and Minotaur rocket programs that have come before it," said Orbital President and CEO David W. Thompson in a statement. "The successful introduction of the Antares launcher, with its contribution to our COTS and CRS programs along with future sales to other customers, is a linchpin of the company’s long-term growth and profitability strategy." "COTS" and "CRS" refer to NASA's Commercial Orbital Transportation Services and Commercial Resupply Services programs, respectively. These efforts will coordinate the use of private spaceships to deliver cargo to the space station. The Antares rocket takes its new name from the star Antares, which is one of the brightest stars in the night sky and the brightest star in the constellation Scorpius (the Scorpion). The rocket stands about 131 feet (40 meters) tall and is designed to launch payloads of more than 11,000 pounds (5,000 kilograms) into low-Earth orbit. It will make its initial launches from NASA's Wallops Flight Facility on Wallops Island, Va.
"Antares is one of the brightest stars in the skies and we expect the Antares rocket to be one of the brightest stars in the space launch vehicle market," Orbital officials explain on the company's Antares website. "Orbital selected the name in keeping with the company's tradition of using Greek-derived celestial names for launch vehicles." This isn't the first time the name Antares has been chosen for a spaceship. In 1971, NASA's Apollo 14 mission to the moon carried a lunar lander dubbed Antares. NASA astronauts Alan Shepard and Edgar Mitchell rode the Antares lander down to the lunar surface and spent 33 hours and 31 minutes on the moon before returning to their command module in orbit. 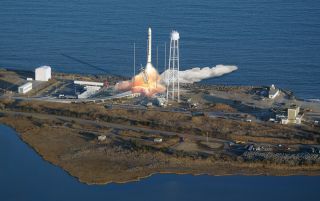 Orbital Sciences currently plans to launch at least two Antares rocket test flights in the first half of 2012. The company currently has a $1.9 billion contract with NASA to provide eight cargo delivery flights to the space station using the Antares rocket and the Cygnus spacecraft. NASA also has as $1.6 billion deal with another company, the California-based firm Space Exploration Technologies, for 12 cargo flights to the station. With the retirement of NASA's 30-year space shuttle program earlier this year, the space agency is relying on the emergence of new private unmanned and manned spacecraft to launch American astronauts and cargo into orbit.